You can put many aspects of owning and managing rentals, such as rent collection, on autopilot. But not everything. Property maintenance and upkeep can eat into your revenue and cause stress, and occasionally, make you wish you weren’t a landlord. The good news: there are easy and affordable ways to keep up your property and increase your cash flow at the same time. I bought my first house when I was 22, and I’ve enjoyed success (with a couple of failures) by investing in real estate. 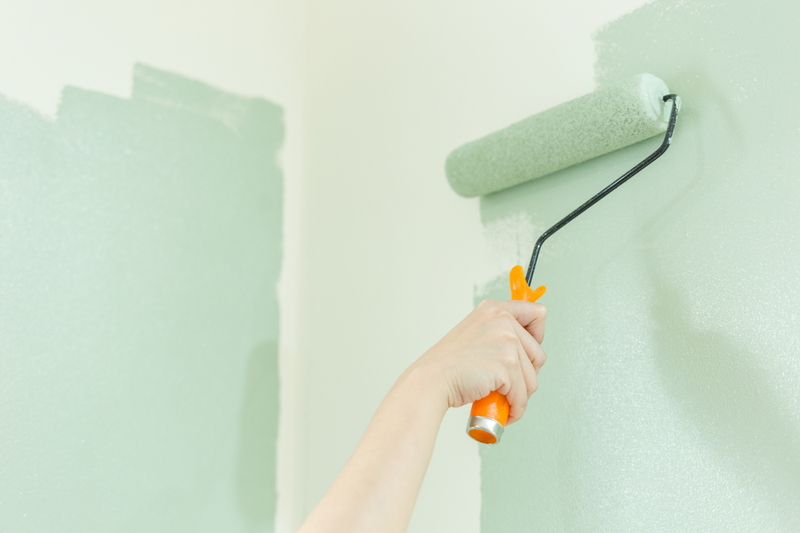 Along the way, I discovered these affordable upgrades for rental properties. Jen from The Thrifty Home documents her re-painting experience, and she shares before and after pictures of her kitchen. Tip: Don’t try to use Ikea cabinet doors on non-Ikea cabinet frames. A lot of investors buy badly mixed paint that paint stores and hardware stores sell at a steep discount. The problem with buying these kinds of paint, when you’re working on a large-scale, is if you have to do any touch-up work, it’s a nightmare to match paint. I highly recommend you negotiate a discount for a large bulk order of paint. You should be able to get another discount by opening a company account where you buy paint. I get my doors at my local hardware store and don’t pay any more than $80 a piece for them. You should also check with a local building supply company, which may have extra doors at a deep discount. With a little help, you can install a new door without changing the frame. I usually pay about $250 to have a house pressure washed. Or you can do it yourself. It’s easy to pressure wash a house with a long wand. Landscaping can directly reduce your vacancy rate. If you’re willing to a do a little work yourself, landscaping materials can be inexpensive. Whenever I have a hard time renting out a property, I buy some flowers to put outside. Within a week, I have the property rented. This could be due to other factors, but the cost for flowers is less than $40. So now I make it a practice to have nice flowers when weather permits. Choosing carpet for a rental property is a rookie mistake. Carpet is NEVER a good option. Carpet gets stains and looks dingy after minimal wear (especially with cheap carpet). In my experience, carpet in my rental properties needs to be replaced every five years. Tip: Light-colored hardwood doesn’t show scratches as much as dark hardwood floors. This upgrade pushes the boundaries of affordable. However, I’ve experienced a good return on this investment. I routinely add an extra $50 to $80 per month in rent for a stackable washer/dryer. I buy my washer/dryer combinations from Craigslist for $100-$150. However, you can get a brand-new one from Amazon for around $600. I’ve also bought new kitchen appliances from Appliance Connection, and I’ve been very pleased. I hope this gives you some ideas on affordable ways to upgrade your rental properties and achieve higher rent! Do you have other tips about reliable upgrades? Share them in the comments! Previous PostHAPPY Valentine’s DayNext PostThinking of MOOving?